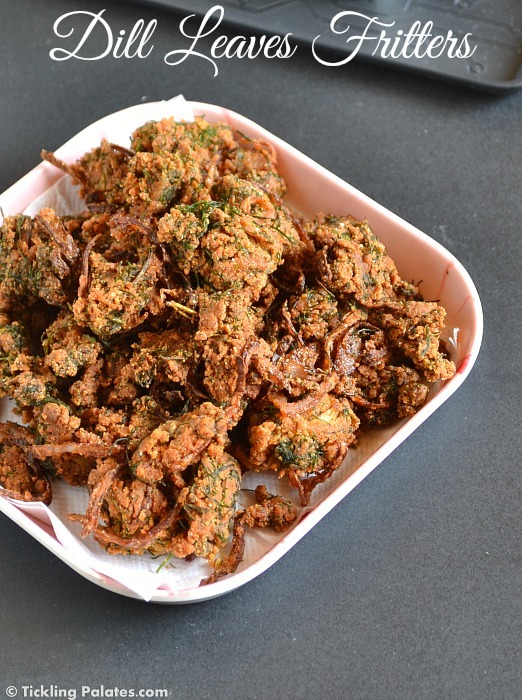 Dill Leaves Pakora Recipe. A crunchy and crisp tea time snack made using dill leaves. Its vegan and also gluten free. 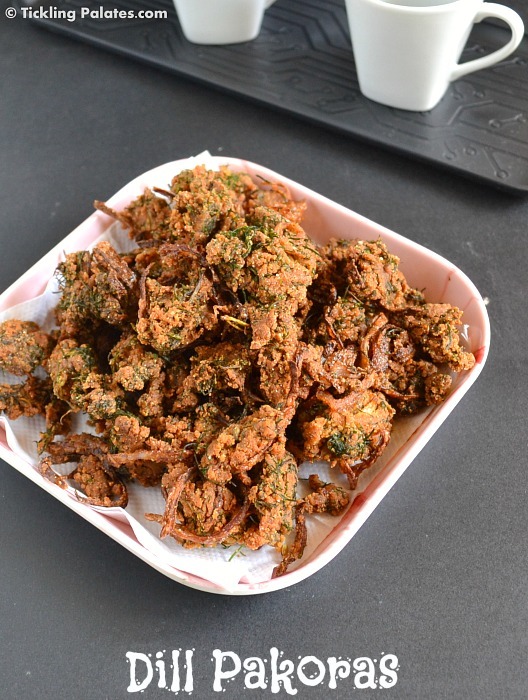 These dill leaves pakora will be just perfect as an evening snack for you especially on a cold evening. Dill leaves are known as suva or shepu bhaji up North, and are available at large, but where I’m, these are a very rare find and when I found a fresh bunch of dill leaves in the veggie shop, I simply could not resist buying them. This is the first time I’m cooking with these leaves. The leaves are fern like and the aroma is just mind blowing. The kids at home found it a bit over powering while I was cleaning them, so I wanted to make a snack to be on the safer side instead of making a dal or stir fry with these leaves. They are also used in salads both for health reasons and for their aroma. I have yet to try it though. 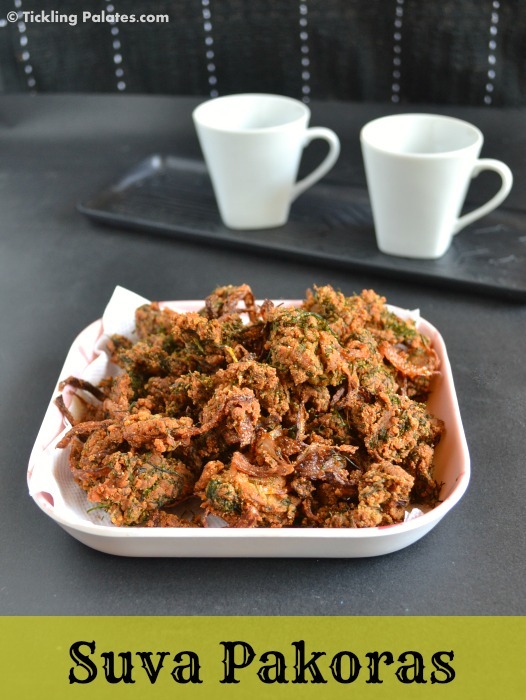 But these dill leaves pakodas (Fritters) are to die for as they were so crisp and yummy. Unlike the regular pakodas these are full of the aroma of dill leaves and when cooked though the kids were quite happy to have them as it was not that over powering. I do wish I get these leaves regularly at the veggie shop where I shop near my place. So do give it a try and I’m sure you also will like them and instead of the same old pakodas these will make a nice change as well. Cook the pakoras over medium flame. As we have added dill leaves, if cooked over high flame they will get burned quickly and will give out a bitter taste. After the pakoras have cooled down completely to room temperature, you can also store them in an air tight container and they remained good for the next 2 days at room temperature itself. The temperature of the oil needs to be perfect. If cooked over low flame, they will start drinking more oil and if the oil is very hot, it will get burned. A crunchy and crisp tea time snack made using dill leaves. Its vegan and also gluten free. Chop the onions into juliennes. Finely chop the green chilies. Wash and roughly chop dill leaves. In a mixing bowl, mix together onion, green chilies, ginger garlic paste, dill leaves and salt. Keep aside for 10 mins. In another bowl mix together besan (chickpea flour), rice flour, red chili powder, baking soda, turmeric powder and fennel seeds. After 10 mins of resting time, you will find the onion mixture have let out more moisture. Sprinkle the flour mixture all over the onions and dill leaves mixture and keep mixing with your finger tips. The mixture will start to resemble like bread crumbs. If you see more dry patches of flour, just sprinkle 1 tsp of water at a time and form a crumbly dough. Heat a deep frying pan with oil. Drop a small ball of dough into the oil and when it rises immediately to the top, the temperature of the oil is just right. Drop spoonfuls of dough into the oil till the pan can hold. Cook over medium flame turning the pakoras (fritters) once or twice in the middle. Once the sizzling of the oil subsides, remove the pakoras and drain them on a kitchen paper to absorb the excess oil. 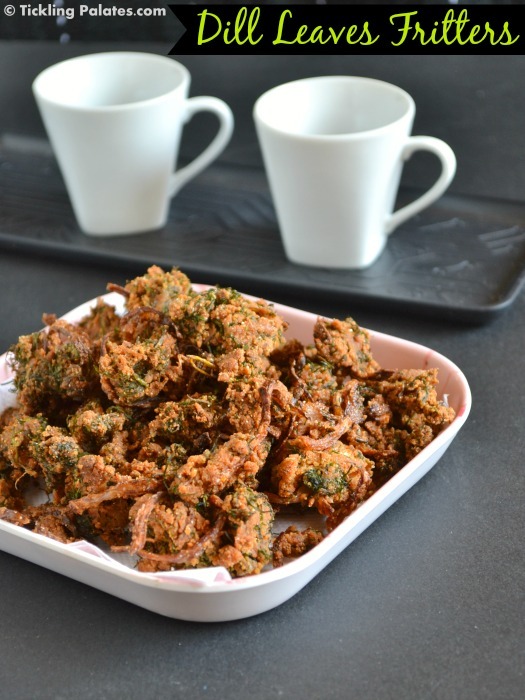 Serve this dill leaves pakora piping hot with tea or coffee. looks super crispy and tasty.. Can u pass me the plate? OMG…Look at the photo What a colourful fritters. Nice and crunchy. Superb. 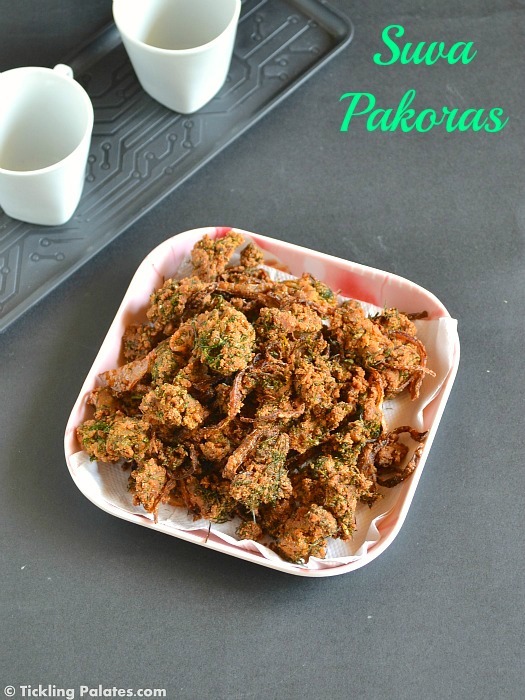 Wow……an aromatic mind blowing pakodas……..crispy and lovely teatime snack. Delicious and lovely looking fritters. Excellent preparation. Happy New Year to you. This is so totally new-to-me and sound delicious! tempting snack for this cold weather, love it!!!! Crunchy snacks That’s my favorite dish . Really It’s so great dish . Suva saag is very healthy as you have pointed out. Pakodas are a good way to get kids used to the flavour. Notes are very helpful too. I have a recipe with suva saag waiting to be posted too. You didn’t mention the consistency of the batter. Should it be same as regular pakoda. .? The dough should be like the regular pakoda only. It should not be loose batter. Thank you for this. I wanted to do something that wasn’t sabzi, not a huge fan of shepu. I might have browned mine a little bit extra. Hi Sharon, I’m not a big fan of it too. That’s why fritters instead of a sabji.